This Single Tote is a very well made Single tote bag. There is a side pocket which carries a pair of bowling shoes along with a front accessory compartment. Great looking bag. I inspected the bag: the zippers look sturdy, room for shoes, and my nephew loves the camo. I'm looking to buy a 3 ball bag and now I'm really going to consider a KR bag. He'll have this bag for years. My Nephew was real excited to receive. Uncle pleased. My nephew wanted this bag. He was real excited to receive it. As the Uncle who purchased the bag I was really pleased with the quality and the room. It was easy for him to put his shoes into the sides. Plus he was able to put his towel and the bottle cleaner in the front. What I liked was there was a strofoam bottom for the ball. For the price I thought this was a nice bonus. Hello! This single tote will store one bowling ball. 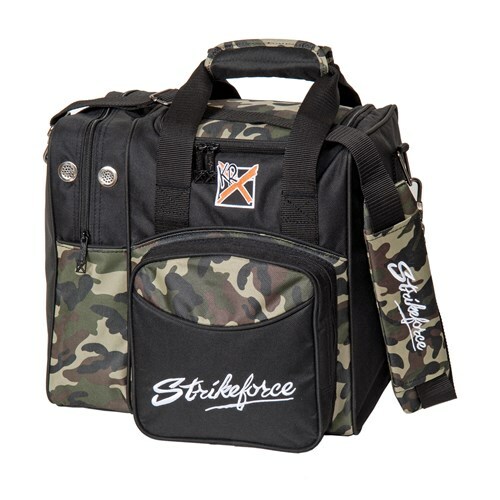 Due to the time it takes to produce the KR Strikeforce Flexx Single Tote Camo ball it will ship in immediately. We cannot ship this ball outside the United States.